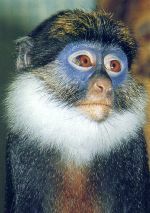 The red-bellied monkey weighs 2 - 4.5 kg (4.4 - 9.9 lb). It is arboreal, living in moist tropical forest and the wettest parts of dry tropical forest. It is also found in secondary bush and old farmland. Its diet includes fruit, insects, leaves and crops. Solitary males have been observed, but usually the red-bellied monkey forages in small groups of up to 5 individuals, although groups of 30 or more probably occur (Oates 1985) . This monkey is known only from southwestern Nigeria and southern Benin. It is threatened by hunting and habitat degradation from agriculture and logging. *** The red-bellied monkey does not adapt well to highly degraded forest. The female red-bellied monkey weighs 2 - 4 kg (4.4 - 8.8 lb); the male weighs 3.5 - 4.5 kg (7.7 - 9.9 lb). The red-bellied monkey is found in moist lowland tropical forest and the wettest parts of dry tropical forest. It is also found in secondary bush and old farmland, usually in dense vegetation between 2 - 15 m (6.6 - 50') (Kingdon 1997) . The red-bellied monkey is found in the Guinean Forests of West Africa Biodiversity Hotspot (Cons. Intl. 2005). Fruit, insects, leaves and crops. The red-bellied monkey is arboreal. Solitary males have been observed, but usually the red-bellied monkey forages in small groups of up to 5 individuals, although groups of 30 or more probably occur (Oates 1985) . At the heart of the red-bellied monkey's remaining range, a spacing of 1 group per sq km (1 group per 0.4 sq mi) has been estimated (Kingdon 1997) .